Ok so Hotmail is tired, and Gmail is wired. However, you’ve got so many people trained to use your old Hotmail address that you can’t just leave it behind. 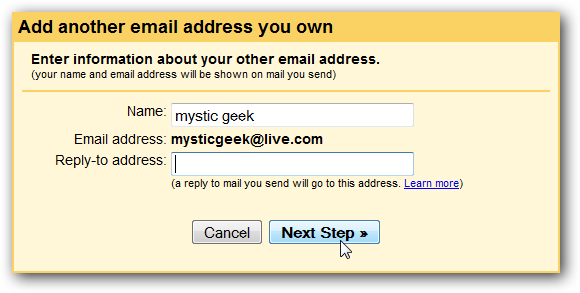 Well Mysticgeek of How To Geek shows you that you can setup Gmail to both send and receive using your @hotmail.com, @msn.com or @live.com email addresses… but from within Gmail instead. Note this isn’t the way that I do it, I have an OLD Hotmail account and it allows for email forwarding but this method should work for everyone else now that Hotmail has enabled POP access. First go into your Gmail account and select Settings then click on the Accounts tab, now click on “Add a mail account you own”. In the next screen enter in the Hotmail or Live address into the Address field then click on Next Step. In the next section we need to enter in the proper settings so the connections work. 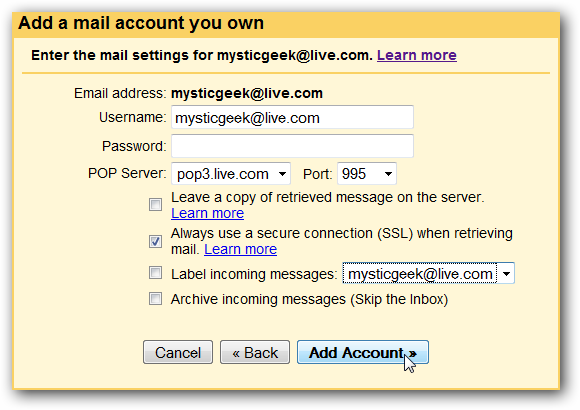 Enter in your username and password for your Windows Live account. Make sure the following settings are correct. You can also select leaving a copy on the server and archive incoming messages, these settings are per your preference and will not affect the connection. When everything looks correct click on Add Account. Note: If you want to leave your messages in your Hotmail account, make sure to select the option for “Leave a copy of retrieved messages on the server”. Next check “Yes, I want to be able to send mail as…” This will allow you to send email as your Hotmail or Live account then click Next Step. Now you can verify or edit the name on the email or if you’d like replies to be delivered to another account enter in a different Reply-to address. 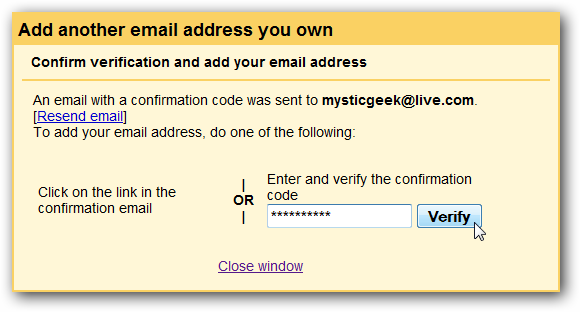 Finally Gmail will send a verification to your Hotmail or Live account. Once you get the verification code enter it and click the Verify button and your done! To send an email using your Hotmail account, just use the “From” drop-down when composing a new message. Now you can Send and Receive your Hotmail in your Gmail Account! Thanks MysticGeek! I ought to appear into this and it would be a difficult job to go over this totally right here.